Goondiwindi Regional Council operates a time limited regulated parking area in the Goondiwindi Central Business District. The maximum time limit is two (2) hours and is designed to provide short term parking only. The intent is to benefit shoppers and business operators by frequently turning over the available parking resources to as many drivers as possible. The time restrictions are in operation between the hours of 8.30 am to 5pm Monday to Friday (statutory holidays excepted) and 8.30 am to 12.00 noon Saturday (statutory holidays excepted). Disabled parking bays are provided for the use of Disabled parking permit holders only. The restrictions applying to the use of Disabled parking bays are in operation 24 hours a day and seven days a week. No stopping signs are used to inform drivers that it is unsafe to stop your vehicle in the given location and the restriction is in operation 24 hours a day and seven days a week. A continuous yellow edge line painted on the road can also indicate a No Stopping area. No parking signs are used to inform drivers that it is not a suitable location to park their vehicle. Drivers that are either picking up or dropping off passengers or goods and stays within 3 metres of the vehicle at all times and for a maximum period of not more than 3 minutes are exempted. All drivers needing to park for longer than 2hours are encouraged to use the free off-street all-day parking. This will enable the 2-hour time regulated on street parking bays to be turned over as often as possible so that they are available for use by drivers needing short-term parking. It will also guarantee that you will not receive an infringement notice for exceeding the maximum time limit permitted. The free all- day off-street parking areas are all centrally located, provide easy access for shopping and are available at the following locations. The carpark located at 58-60 Callandoon Street, Goondiwindi has 72 car parking bays. The carpark located at 9 McLean street, Goondiwindi has 39 undercover car parking bays. Goondiwindi Visitors Information Centre car park located at 45 Bowen Street, Goondiwindi has 34 car parking bays. 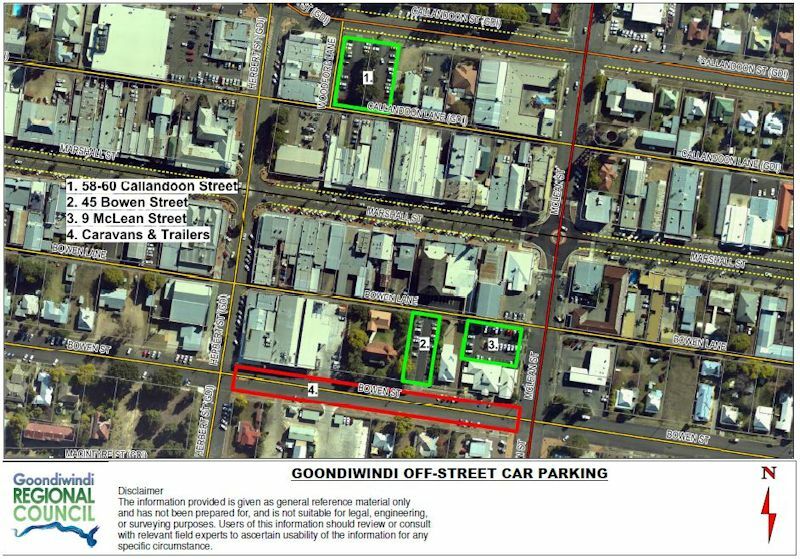 Vehicles towing caravans, trailers and boats and needing to park in the Goondiwindi Central Business District are directed to park in the section of Bowen Street between Mclean and Herbert Street. If you have received a fine or infringement notice, the following are your payment options, appeal options and information about what happens when a fine or infringement notice is not actioned. Your options for if you wish to appeal a fine, how to lodge a statutory declaration and guidelines for appealing. What happens when you do not action a fine or infringement notice and how SPER may take enforcement action against you.